In 2012, Griffith University in Australia undertook a three-year study examining whether ‘participation in early-years swimming lessons impacted subsequent milestones in child development.’ Not only was there definitely a correlation, it also showed the ability to develop a wide range of physical skill, as well as scoring better in maths related tasks and visual skill, for example cutting paper, colouring, and drawing lines and shapes. Swimming has so many benefits at a young age and it is crucial to keep their water confidence up. We understand it can be tricky to keep developing their confidence outside of their lessons with homework, after school clubs, football practice and everything else getting in the way. This is where we come in. 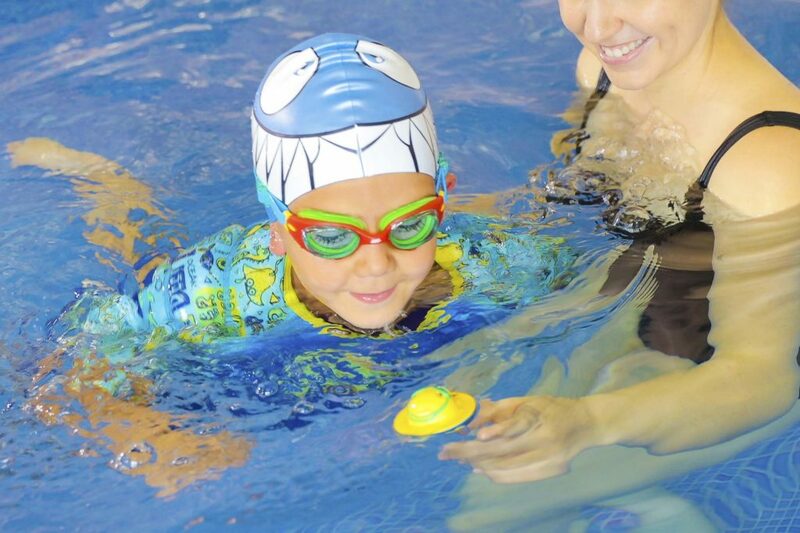 Zoggs has come up with the best ways to help develop your child’s water confidence away from their lessons whatever their age and ability. When your little one is just starting out learning to swim it is all about introducing them to the water and making them feel comfortable. We know it can sometimes feel more like a hassle than its worth, try to get changed at home this will limit the time spent in the changing room and gives you more pool time. Make sure you take some toys they use in the bath (for example Zoggy Soakers, DC Super Heroes Splashems) so they have some familiarity, this will make them feel more relaxed. Try out a trainer seat to give them a little independence with you nearer. Don’t forget they can get cold, if it is a little chilly, try the Zoggs Baby Wrap, this will keep them warm as they get used to being in the water. Once your little one seems to be actively trying to move, splashing and kicking in their trainer seat start creating a little distance between yourself and your baby (within arm’s reach). Once you feel confident enough, try and move them into a swim ring or a buoyancy aid to give them a little more freedom of movement. This is where kids really start to love the water. Try and use a buoyancy aid to continue that support this could be using some Zoggs Float Bands, Back Float or Swim Jacket. At the beginning of this stage make sure you are still within arm’s reach. 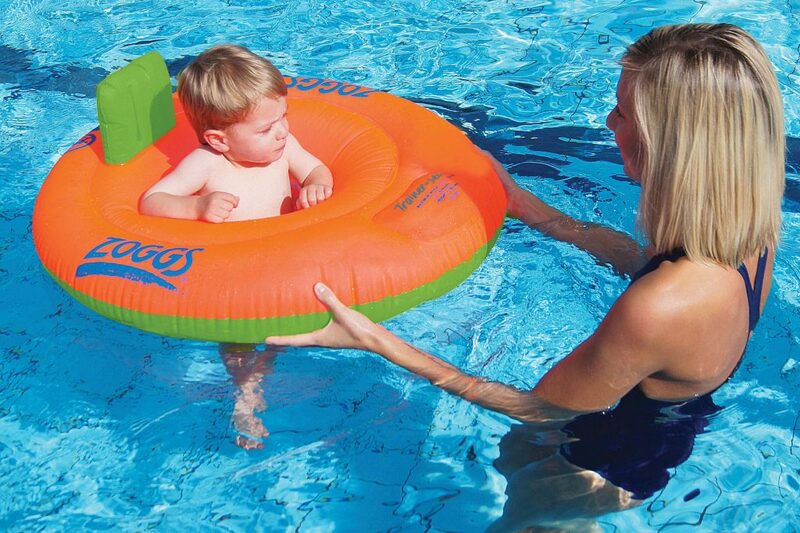 Gently pull your child around the pool getting them used to being in the swimming position. If they are feeling a little more confident and to normalise breathing underwater practice holding your breath and blowing bubbles in the water. If your child is a little nervous try the Zoggs Seal Flips, this encourages the child to blow bubbles to move the seal flips around on the surface of the water. As your child feels more confident in the buoyancy aid, build the distance and get them to swim towards you. Alternatively use floating toys, Zoggy Soakers, Seal Flips, DC Super Heroes Splashems as a throw and retrieve game – as their confidence builds the further, they can go. If they are looking confident try them in the Zoggs Water Wings Vest this can help them into the swimming position and the flexibility of the arms allows them to really perfect their technique. Once your little one is swimming freely in the buoyancy aid and feels like they do not need your guidance, try removing the buoyancy aid for short periods, this will allow them to feel the buoyancy of the water. However, make sure they are within their standing depth and in close proximity to you as they can often feel nervous about this stage. 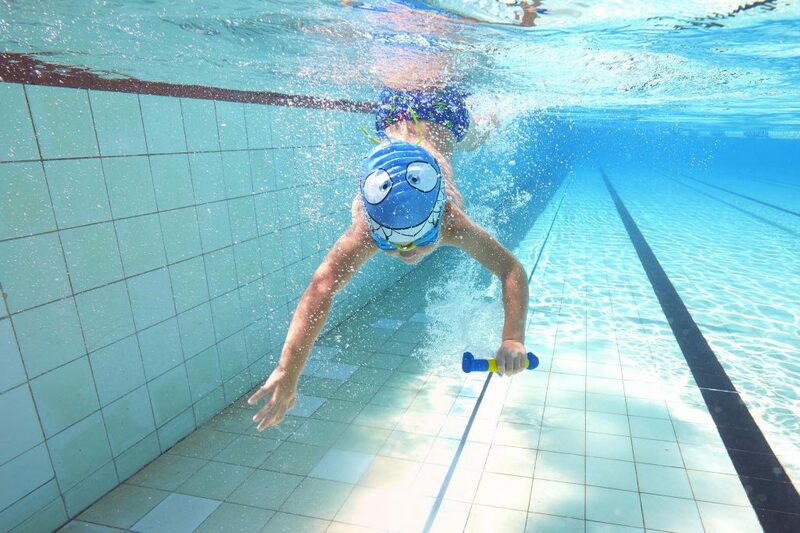 Get them to swim short distances by standing a small distance away or again using some pool toys. As they become more confident increase the distance. Do not rush this stage as this can sometimes take a little longer than normal. Once your child is swimming confidently without a buoyancy aid this is where you can start developing their stroke technique and confidence. Zoggy Dive Sticks and Dive Rings are great for this. 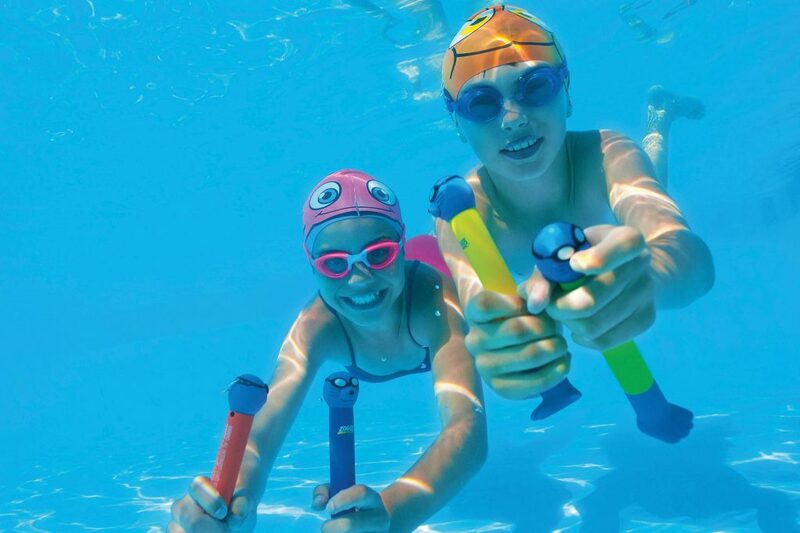 Place the Dive Sticks on the bottom of the pool and the kids can collect them one by one or in a colour order. This is a great way at getting them to practice holding their breath. Overall the key to building your child’s water confidence is swimming frequently, make sure you head to your local Everyone Active pool frequently so they get used to being in the water. It is a great activity for some family time and making some fun memories! The most important thing, whatever stage they are at is that they are enjoying the water, if they are not feeling ready to move to the next stage, there is no rush.